I need help on which stats & skills should i up for PvM and maybe some guide about equipment too. Ty in advance. I wish I could help but am not that good about knights, maybe tried to talk to a knight ingame? Aura has some good pvm players maybe ask someone who is a member of that clan? Since you said you're new, you can just dump all the stats on the 2 basic or main stats of the knight/soldier... Str and Dex. For starters, you can just go with 400 str 300 dex then drop the remaining points to either charm or sen or a mix of both. 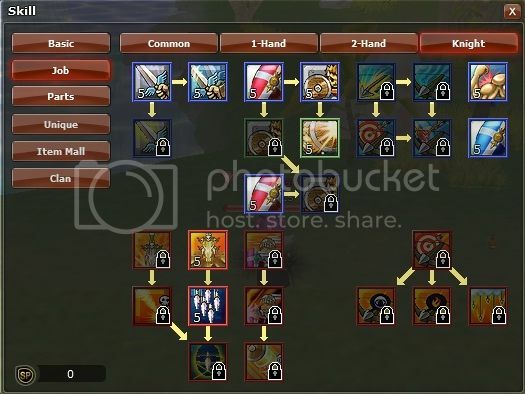 This will allow your toon to be stat reliant and will do "fine" on dungeons even if you have average gears and/or without valor/honor passives but once you have enough passives or the resources to get upgraded armor gears with specific element, you can reset and drop some dex/str and put some more cha/sen. For the armor gears, you can never go wrong with exalted guard but once you have enough passives or the resources to get upgraded armor gears with specific element (yes i copy and pasted it from my statement above) , then you can switch to exalted sentinel for a better dps. End game knights also tends to gear up with valor gears but personally speaking, exalted gears are more than enough. Your end game shield should be the Dreadsword from item mall. Supdo may be the best shield for pure tankers but the 15% atk speed difference from dreadsword is good trade for that small amount of hp/def that supdo offers. 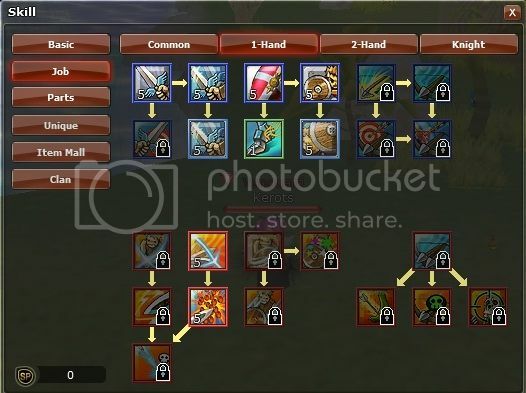 Weapon choice should and always be Endless blade as it has good atkspd and accuracy. As for the accessory, hands down to Luna set as it will be the best choice for atk spd types and will make your knight reach 50% crit with full class buffs (scout/cleric), full crit passive (12%), at least lvl 80 face rune and about 50 sen without even using any crit sub stat. Edited by DrJoe, 06 August 2017 - 04:21 PM. Ty for the info, i appreciate it. Could u kindly SS yer skills for me. Also, 1 question regarding Mall skills. I brought and use Guardian Might Tome, but it can't be ups. Does all skills from Mall cannot be ups? 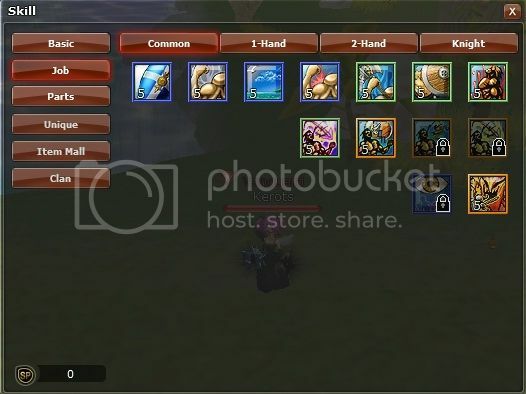 1 more thing, does Knight really need atk spd? Coz i hardly use auto-attack. Edited by Uruza, 08 August 2017 - 01:42 AM. It depends on your build. If you go for AoE attacks, then you don't need any attack speed. But the AoE attacks of the knight are very low damage nowadays. And the cooldown is very long now. It was different before. Since they changed it, I changed my knight and skipped the AoEs. My knight is still tanky but is aspeed/ap now. And since I do mostly pvm at the moment, it is aspeed/ap with pvm shield bash. The IM skills can not be leveled. When you learned it, you are done. The only one I have on Level 5 is Sacrifice. Did you learned that? That is a must have for knights. I also have Shield Spikes and Adamantine Fist. Thx for the info, i do have Sacrifice. Is it worth it to learn Adamantine Fist? I was planning to buy that too, but hesitate coz i can't up my 1st Mall skill. You absolutely need Shield Spikes. One of my most used skills. It is an active skill and gives Reflect Attack 20% and Damage Reduction 20% for 20 seconds. Cooldown is 35 seconds. it helps to tank. And that's the knight's job. Adamantine Fist is a passive skill and gives 5% Attack Power and 5% Defense. I think it is worth it. So I have this skill. I don't really recommend my skill build to anyone as it is specifically built with the consideration of a perma raider+cleric on a dungeon run. It is the #2 build on my reply above and since it doesn't have a pvm shield bash, it relies on the raider's stun to cancel the boss's debuff attempt on cou. Edited by DrJoe, 08 August 2017 - 05:30 AM. + main stat is Str, then Dex (~400 or more Str, ~280 or more Dex). + Some Charm for decent self buffs and Crit Def (about 140 or more). + Shield: sopdu shield (with block rate gem or damage reduction gem) for tank, Dread sword for damage mode.